On April 5, 2019, our grand lady Lorraine Driver Gregory quietly transitioned to be with her Lord and Savior Jesus Christ. She was preceded in death by her parents Samuel and Lorraine Cook-Driver. 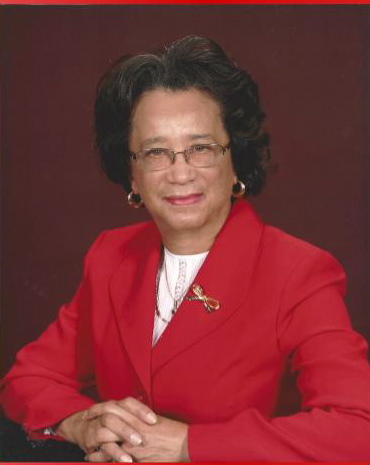 She joined First Morning Star Baptist Church in her youth where she served in several committees such as Financial Secretary, Senior Choir, Scholarship, Trustee, Assistant Treasurer, and Treasurer. Trustee Gregory also organized the Christian Education Ministry at the church. She also belonged to the church Convalescent Outreach Ministry. Libby was also the Chairperson of the Guinea Jubilee for 23 years, where everyone enjoyed coming to First Morning Star’s food booth. Especially Libby’s delicious crab cake recipe. Libby was part of the nursing home devotion team too. She was loved by many, especially her family and friends. She loved her husband Clyde, children, and grandchildren unconditionally. She enjoyed serving the Lord at her church, helping others, spending time with her family and friends, traveling, and enjoying time in her yard. She was a member of the Saturday Bridge Club and a Pinochle group. She graduated from Bena-Hayes High School in 1950, she then attended Virginia Union University and graduated in 1954 with a bachelor's degree. Libby was also part of the Williamsburg Alumnae Chapter of Delta Sigma Theta Sorority, Inc., Iota Phi Lambda Sorority, Inc., and the Red Hatters Classic Chicks of Hampton Roads. She retired from Civil Service at Fort Monroe then took a short break and started working for her cousin Eldridge Cook seafood business. When Cook’s Seafood closed she worked at Tri-County Mini Storage. She is survived by her loving husband Clyde Gregory, step son Wayne Gregory (Constance) Philadelphia, PA and step daughter Waynette Gregory-Ingram (Thomas), Chesterfield, VA . Four grandchildren, John Simon, Philip, Mark, and Monique’ Gregory. Brother in laws, Wilbur Gregory, Leroy Gregory (Anne), James Gregory, Jackie Gregory (Altena), Richmond, VA, John Jr. Sydnor, and Jerry Sydnor, Chester, VA. Along with sister in laws, Fredonia Miller, Richmond, VA, Claudette Cherry (Bobbie), Tina Jones (Calvin), and Gale Sydnor Yates, Chester, VA. As well as a step son, Richard Christian (Stephanie) and step daughter, Sheena Christian-Howard (Victor). Cousins Carolyn Lemon (Franklin), Gary Cook, Virginia Cooke, Barbara Douglass, Patricia Cook, and Janie Cooke, including extended friends we made family. Services for Mrs. Driver- Gregory will be held noon Wednesday, April 10, 2019 at First Morning Star Baptist Church 8906 Guinea Rd, Bena, VA. 23072 by Pastor Larry Arrington. Family vistation along with the Delta's Omega service will held fron 6:00 until 8:00p.m. Tuesday, April 9, 2019 at the Church. In lieu of flowers send donations in her memory to First Morning Star Baptist Church Building Fund. The family of the late Mrs. Lorraine Driver- Gregory has entrusted her final care to the staff at C.C. Carter Funeral Home, Inc.